All the time I was doing my arts degree I was volunteering at the museum – working on fossils, learning everything I could about science. The curator would ask who wanted to go on field trips – my hand was always up. They clearly got that I was interested in this sort of stuff. The guy in the lab coat could have been the curator of fossils or the cleaner – it doesn’t matter to me, he changed my life. What I love about museums is the reach into the community. Even when I was running the museum, if the opportunity arose to talk to kid about what are interested in, I would always grab it. If you see some kids looking at the exhibits, take the time to talk with them, it could be hugely important. My favourite places – swamps where I looked for frogs – were being filled in with rubbish, the beach with oil and junk floating in the ocean and thinking this is not right. I asked my mother about it and she said “that’s progress”, and I decided then that this “progress” was a pretty bad thing. I put my hat in the ring for a job – the only job in the country I really wanted, a scientist at the Australian Museum in Sydney – curator of mammals. I did twenty marvellous years doing survey work in the Pacific Islands. We called it Rattus detentus because its ancestors had been detained on Manus island, also we were well aware of the plight of the detainees there. (A slight subversive name?) Yeah, just to let people know they haven’t been forgotten. What can a scientist do with that sort of stuff, not much really, but this was an opportunity, and that name will be there forever, so they will be remembered. Boaty McBoatface – if the people want it then I’m firmly of the view that they should get it. I don’t like power structures…there is true wisdom in the people, if you can tap into that wisdom you will achieve great things as society. As the new director of the South Australian Museum…engaging with the SA government that I became aware of what a huge challenge this climate change issue was. Future Eaters: The people of Australia were really the first to start eating their future, eating into their capital that was meant to sustain them into the longer term. A spectacular manifestation of the nature of what it means to be human. The book came about from 15 years of questions I just couldn’t answer. There’s something about my personality. I do think about difficult questions, and I tend to do it from first principles basis. I can’t just live in Australia without understanding the place. Some of those questions are big and complicated, and do take a while to work through, but I’m very happy doing that, picking away at the puzzle, a giant jigsaw no-one’s ever done before. Weather Makers: I tried to distil the science into a form that was understandable by the public but still faithful to the original research – all held together with a story of human impacts on this very complex climate system. There was a nasty backlash…once climate change became a political issue in Australia there was no holds barred…it was really scary for a while, I had to have federal police protection at home for about four months – that was tough. There’s a lot of economic interests in Australia, tied into the fossil fuel industry. We had a bigger share of the export market for coal than Saudi Arabia does for oil. Those industries were very embedded in government and society. But I knew the reason this was happening is because I’m winning, I’m having an impact. If I wasn’t having an impact then none of this would be happening, they wouldn’t be bothering. (Geological time-scales it doesn’t really matter what we do) That’s true, but what sort of argument is that? Where does that leave us as human agents? Where does that leave us in terms of care for our children and future generations? This has to relevant to us as people in some sort of moral framework we live in. (Are we at the point of people understand climate change but don’t want to?) If I believed that I’d be doing a different job. I think that carrying on explaining it is making a very big difference. People come up to me all the time saying I embarked on this career, chose this PhD, because I read your book and wanted to do something…some of those people are now running significant companies – renewable energy companies and so forth. So it makes a difference but it takes time. I’m a really big believer in the wisdom of common people – if you can tap into that , into people as individuals and their sense of what is right and wrong, then you’ve done somthing very profound, and that’s what my life has been about. It hasn’t been about going into politics and trying to lead people, I’ve been much more interested in releasing the latent good and capacity in people. When you reach out to people as individuals, even those antagonistic people, you get beyond the façade – the frightened person or the smart arse, and you can reach a real person in there, and that is where the reason and where the goodness lies. empowering people with knowledge, reaching them as individuals, that’s the important stuff, it’s not about political leadership, nor parties or ideologies, it’s about somehow unlocking that individual goodness and letting that flow upwards into some sort of societal structure or shape that gives meaning to all our lives and makes things better for all of us. You have to treat people with dignity and engage in a dialogue. We are now committed by virtue of the greenhouse gas we’ve put into the atmosphere for the temperature to rise by about 1.5 degrees by the middle of the Century. We’re getting into the danger zone (has been at +1.2 degrees for a couple of months). This El Nino has done us a favour in a way, it’s spiked temperatures by about a third of a degree – it’s giving us a little window into the future. In some places, this view seems OK, the great Autumn we’re having, but look north to the Great Barrier Reef, we’ve just learnt that it is 93% bleached, a bleaching event six times larger than anything we’ve ever seen before. And there’s massive and long lasting consequences from that on the reef ecosystem. Arctic ice is at its all time winter low. The thing to remember is that climate change is a process, not a destination. It’s a process of change. 1.2 degrees will transform to 1.5 degrees then 2 and 4 if we don’t do something about the driver. Scientists are now increasingly prepared to say “this weather event would not have occurred were it not for human greenhouse gas pollution”. That’s a big breakthrough – linking individual weather events to the cause. This is a collective action problem – it’s something the whole world needs to act on together. The capacity of any society to do anything about this is driven by passionate individuals. We need that drive to come from society…to drive down emissions. But my personal view is that’s not all we need to do, we also need to get some of the gas out of the air. That’s going to require the development of a whole series of new technologies over time. You need all of those things, you need the technology and you need the will-power to use it. We need the right regulatory structures and the right enabling circumstances in society for this to happen. (is third wave technology a green myth? Carry on having a party, technology to save us is just around the corner?) Excellent question, one we need to answer. From 2016, two things are very clear, first, that we have to reduce emissions as quickly and as hard and fast as possible whether we develop new tools or not. The second is that we don’t really know at the moment whether those tools will have the capacity to draw enough CO2 out of the atmosphere at the scale needed. At the moment humanity is putting 50 Gigatonnes of CO2equivalent into the air every year. Now, if you want to plant trees to take 5 Gigatonnes out of the atmosphere per year, you would need to plant an area larger than the size of Australia. This is a very large scale problem. Can we manufacture carbon fibre out of the atmosphere at a scale that will make a difference? Carbon plastics, CO2 negative concretes? Silicate rocks to draw C02 out of the atmosphere? Seaweed farming? Can we do it at scale? We know all these things are possible at very tiny, laboratory scales. But do they work at the gigatonne scale? That’s the question we need to answer by 2050 if we’re to have the hope of any of these technologies making a real difference. (Scale of problem is going to need solution at that scale, which is more industrial development, which will make extinctions worse…will a focus on climate change make everything else worse?) eg seaweed farming which are a great place to grow proteins.There’s a lot of biological desert in the world’s oceans that could feed the world…if we could cover 9% of the world’s oceans with seaweed farms we could draw down all 50 Gigatonnes. If we can take the problem – atmospheric CO2 – and turn it into a solution (eg sky mined carbon fibre) that competes with other polluting industries you’ve done something major. This is where technological advancements can take us, not just into a more industrialised dirty future, but as a replacement for already dirty processes, and thinking differently about the world in ways that might make a difference. There are always uncertainties, but you have to move forward, you can’t be paralysed by uncertainty. We can have sustainable growth, it depends on what is growing and for how long, but there’s a billion people out there living in abject poverty who need betterment and a better quality of life, so we have to have at least enough grow to give them a decent standard of living. Limits to Growth – general sentiment was right, but was wrong in that people thought we would run out of resources, but it turns out that there are lots of resources – particularly mineral resources – the volume you have is proportionate the amount of energy you’re willing to put into getting them out. The big limits to growth turn out to be the rubbish bin – earth’s rubbish bin, the oceans and atmosphere. That’s the real limit, once the rubbish bin got full…that’s something people didn’t foresee. A vision of where I think we might be going that solves these problems. Imagine a situation where politics is not a career. an you imagine if each one of us had the experience of sitting on a jury to decide the size of the defence budget, or how the health budget should be used, or an aspect of foreign policy. Division of labour works in every area of human life and enterprise, except politics. It’s the one area where we all have to pull our own weight as citizens if we want to have a decent and just and prospering society. (Success) Probably too early to tell, but the establishment of the Climate Council, adopted by the people of Australia. It’s taught me a lot, that process, a lot about structures that work, and how you engage people. (Activist) No, I don’t see the world in those terms. Activist entails that there is a power out there, an authority that we’re fighting back against, and my world paradigm is not like that, I think that the big decisions need to be made outside the political system, and there’s a role for leaders outside the political system to engage in dialogue and influence the public dialogue about things…so no, not an activist, maybe a public intellectual. (Motivation) I think it’s curiosity first and foremost about the nature of the world. And somehow I’ve always had this view that we need to leave the world a better place than we found it – and the only way to do that is to really understand the world. I find this a paradox in me, because I’ve lived through a period where the world has self-evidently got worse, in so many ways over my lifetime – we’ve seen so many extinctions and all sorts of things happening in the environment, and yet I still have this belief that we need to leave the world a better place than we found it. So I don’t know how to explain that, except that it is a profound conviction that I have. And real faith in human nature and people, that is the most important resource that we have- our fellow human beings and unlocking the full potential of ordinary humans to engage in the world and determine their own fate in a wise consultative way is just so central to what we are as a species. (Challenges) Staying fit and healthy. Re-engaging in the Pacific Islands. Community projects in the Solomon Islands trying to foster community conservation – which is really the most important type of conservation in those societies. I reckon it’s like for a woman putting on that lipstick in the morning, you do that and you look great…well climate change is one of those things where you just can’t go and put on the lipstick in the morning, it’s too long a process, there’re very few moments where you can say we’ve won, we’ve done something, but this Pacific Islands work (community conservation), is great, “wow, I’ve already got some success”. The rest of it – climate change – will be a slow grind, I’ll be an old man before we can say we’ve overcome the problem, if I’m lucky enough to live that long. (Smallest thing) Get engaged with a group of like-minded citizens, because anything we achieve is achieved together. ( Advice) You’re a long time staring at the lid – get out there and do something, don’t waste any time. 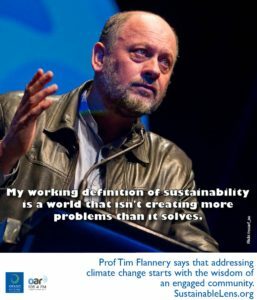 Professor Flannery was in Dunedin as guest of the Centre for Science Communication, University of Otago.